There was an old commercial from the 1970s… Someone would ask, “Is it soup yet?” and the patient, ever suffering hosuewife would say, “No, not yet.” Eventually, she would yell, “Soup’s on!” and everyone would come running. Well, just like that housewife was relieved to feed her hungry brood, I am relieved to say that yes, indeed, the soup is on! I finished the Dutch tool chest this past Saturday, and I couldn’t be happier with it. Based on the design by Chris Schwarz in the October 2013 edition of Popular Woodworking magazine, this baby is the bee’s knees. After building a breadboard end for the lid, I was able to start finishing the piece. This is the first time I have ever used milk paint, and I can tell you now for certain that I will be using it again. I used the product from the Old Fashioned Milk Paint company, and it’s pretty wild stuff. I brushed it on with a foam brush and let it dry. 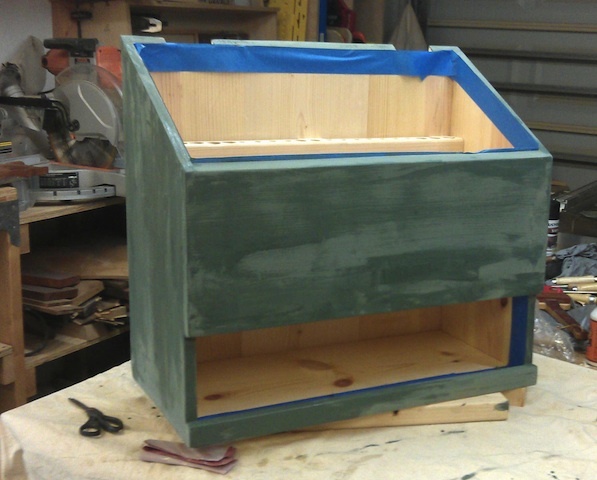 It became a chalky mess, but a coat of boiled linseed oil on top really deepened the color. I used the Sea Green color, but I can assure you that I didn’t need the entire pint. The company’s owner told me that leftover paint powder can be saved in a clear jar and used later. The inside is left totally bare – no finish at all. Chris was pretty adamant that the smell of varnishes or oils would just get trapped inside, and I’m not going to question the guy who has built lots of tool chests. The fun part about the piece is just how much you can store inside of it. 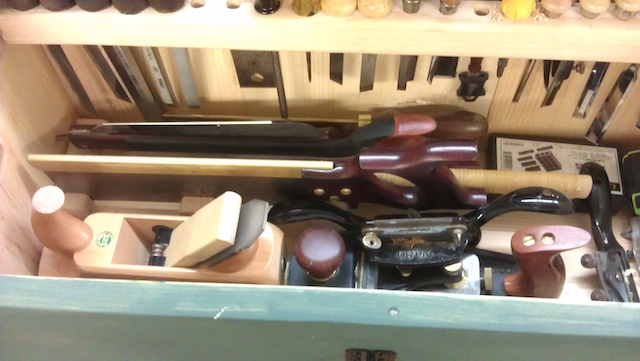 This is just the collection of items I can fit in the top till… planes, chisels, saws, marking gauges…. the works. With these items now handy to my bench, I can get to them a whole lot easier than I used to by rummaging around in the steel tool chest I have. 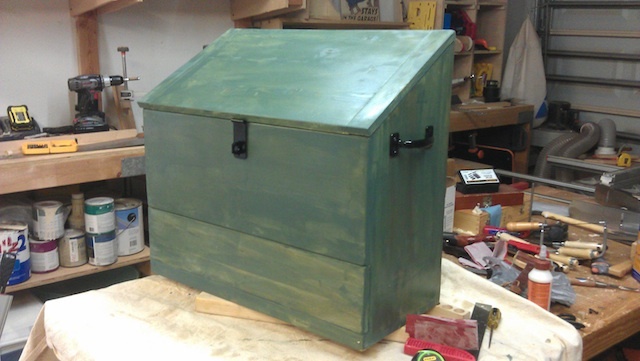 BTW – that steel chest will now be used to house some power tool accessories…. Pretty clever. 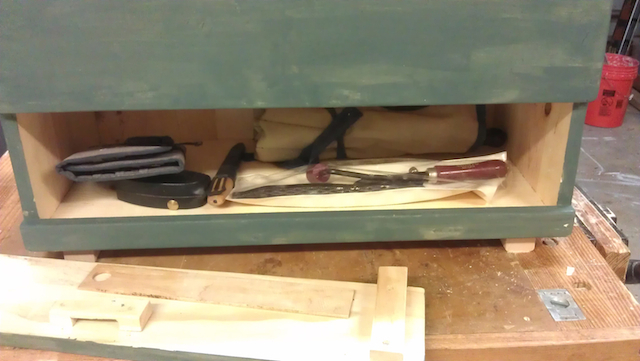 Tucked away, the tools fit nicely into chisel racks, a saw till or on the floor of the top of the case. Since I don’t envision taking the pieces around a lot, I guess I’m not going to need to really secure things down all that well. Parked next to my bench, however, it will be great to have everything close at hand. Downstairs, the one tool bay is able to house a ton of tools as well. 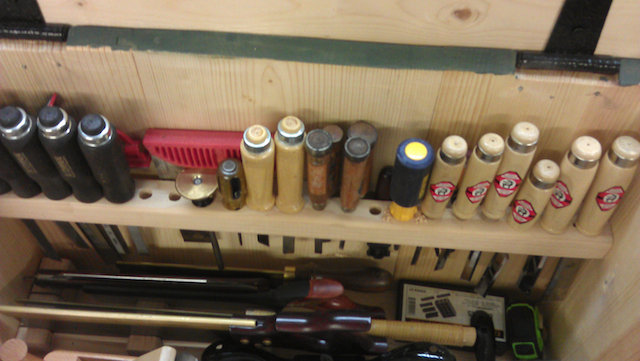 I’ve put scrapers, rasps, my manual drill and other goodies into the bay behind the drop front, and since they are all protected in cases and tool rolls, I have no fear they will bang around. For the hardware, I passed on the hand-forged pieces and just went with the home center variety hinges, hasp and handles. They are surprisingly sturdy for a tool chest this size. But, again, this chest was sized to keep just those essentials close at hand so you can reach them with ease, helping to keep the weight down. Finally, there is a lock. 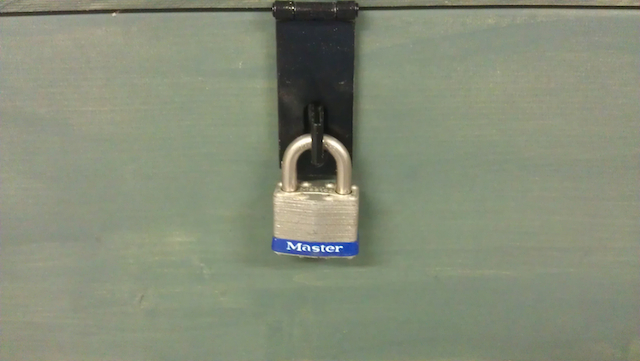 I have had this Master padlock since I was in college, and I have never found a use for it. I don’t envision the need to lock the chest up in normal use, but if I ever do have to move the chest, this will help keep the contents enclosed so they don’t get out. I like! Especially the color. Those chest are amazing in how much they can hold. I use mine every time I work in the shop. Is the lock to keep the tools in? Or the humans out? Or just a photo prop? And now, with your basic tools conveniently placed, you’ll be able to whip out the Tom’s Workbench creations in blinding speed. Looking forward to glamour shots with the greenie tool chest in the background. I’m seriously impressed by the case here Tom. Go on with your bad self. 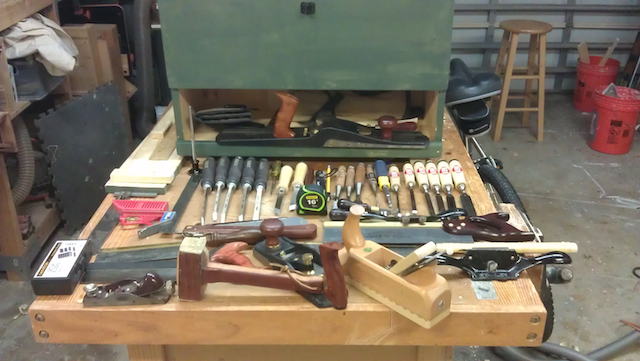 I really need to make a tool chest or cabinet. Nice. Where did you get your hinge hardware? 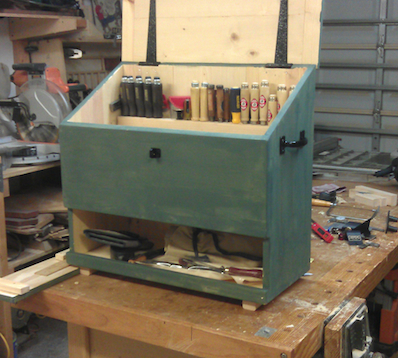 I started my Dutch tool chest build before WIA but still have to finish the lid. Part of my procrastination has been driven by hardware options. Thanks. It was all from the local home center. It works great. I’m impressed, I be obliged to say. Thanks in support of sharing, this is a fantastic blog post. Thanks Over. Save writing.